Often referred to as 'The most beautiful tree in the world'. 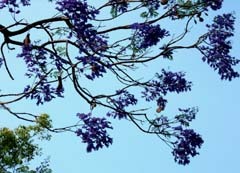 The Jacaranda has been cultivated in almost every part of the world where there is no risk of frost; established trees can however tolerate brief spells of temperatures down to around −7°C (20°F). The panicle flowers appear on the tree in the early Spring before the large compound leaves appear, which themselves are very attractive. These leaves are up to 45 cm long and bi-pinnately compound, with leaflets little more than 1 cm long. The tree grows to a height of 5 to 15 metres. Its bark is thin and grey-brown in colour, smooth when the tree is young though it eventually becomes finely scaly. The twigs are slender and slightly zigzag; they are a light reddish-brown in colour. The flowers are up to 5 cm long, and are grouped in 30 cm panicles. 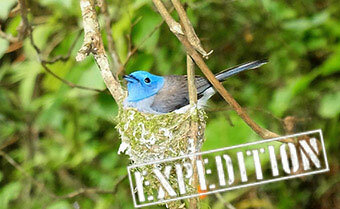 They appear in spring and early summer, and last for up to two months. They are followed by woody seed pods, about 5 cm in diameter, which contain numerous winged seeds.